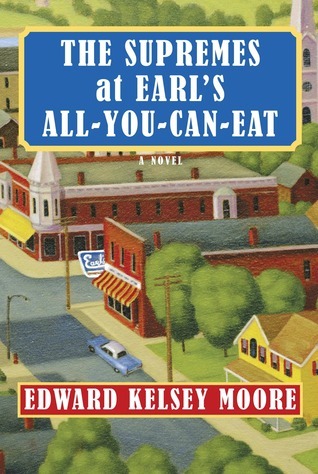 The title of The Supremes at Earl’s All-You-Can-Eat by Edward Kelsey Moore whet my appetite for a good down-home book about female relationships. This book delivers a huge helping of humor, sentiment, and sage advice. Moore’s novel revolves around three middle-aged African-American women dubbed the “Supremes”, who live in a small town in Indiana. They have known each other since childhood sharing colorful histories and healthy doses of secrets. It is witty and sarcastic and I loved it. The story also contains its share of “dead” townsfolk, including oddly enough, Eleanor Roosevelt, who throw in their humorous takes on life which only sweetens the pot. I felt a kinship with these characters, delighted in their successes, and grieved their losses. This is a delightful novel all the way around! I will hope for second helpings to come in the future from Mr. Moore! This entry was posted in Uncategorized and tagged Books, humor, Indiana, The Supremes, The Supremes at Earl's All-You-Can-Eat. Edward Kelsey Moore, women. Bookmark the permalink.